LifeStyle HD is recommended by many eye-care professionals for anyone currently using a magnifier of 4x or higher. The larger screen and high-definition make LifeStyle HD a great choice for reading books and magazines, reading and sorting the mail, viewing treasured family photographs and more. A high-definition image can reduce eye fatigue and the sea-sick sensation that some users report feeling after long periods of time using standard resolution magnifier. 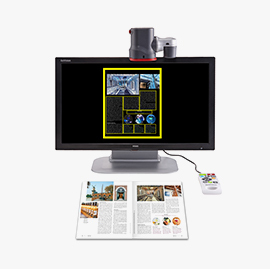 LifeStyle HD can be kept on your desk at work or on a countertop or reading table in your home, and can even connect to your PC or Mac to display what is on your monitor as well (Mac requires additional cable purchase). You’ll love what you can see again! Retain your independence and quality of life. Help people with Macular Degeneration and other Low Vision Conditions. LifeStyle desktop video magnifiers are among the most helpful macular degeneration vision aids for extended reading and writing comfort, viewing photos and performing hobbies and crafts. If you or someone you know has macular degeneration, glaucoma, diabetic retinopathy, inoperable cataracts, or any other low vision condition that is limiting daily living activities, the LifeStyle video magnifier can help to retain or regain independence and quality of life. 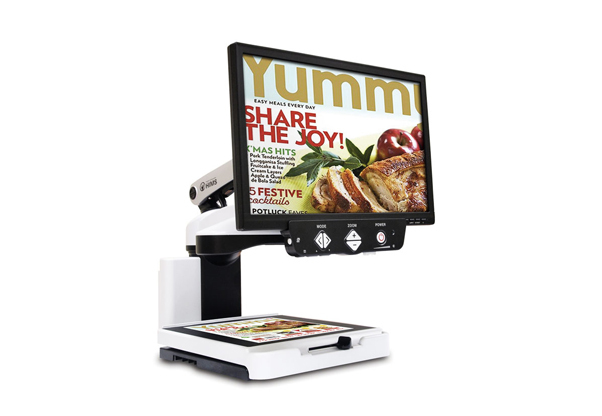 A LifeStyle video magnifier is your low vision solution. Imagine what you can do again! Easily zoom the magnification from 3.1x – 95x. 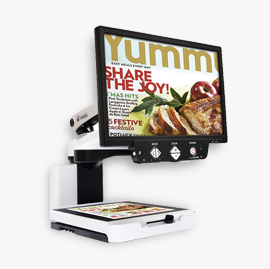 LifeStyle is the only desktop video magnifier that features more than 150 magnification levels. The magnification increases in 1/10 magnification increments from 3.1x – 10x (for example: 3.1x, 3.2x, 3.3x etc.) and in 1x increments from 11x – 95x. 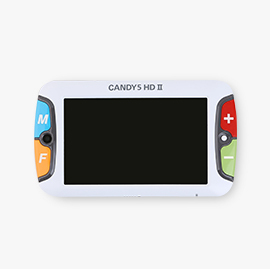 You will have complete control of how much you magnify and how wide of a view is displayed on the screen so you can read comfortably and conveniently. 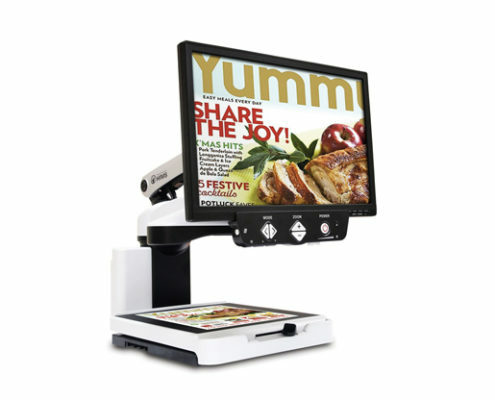 The LifeStyle HD desktop video magnifier (CCTV) is one of the most popular products for the visually impaired, including people with macular degeneration. 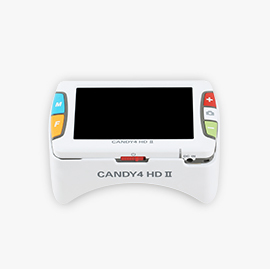 Introduced in June 2011, its one of the first high-definition desktop video magnifiers available on the market. 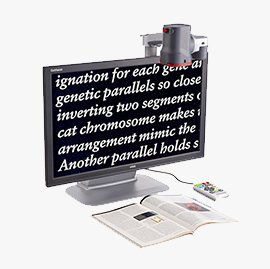 With the LifeStyle HD desktop video magnifier, many users can read at a smaller size due to its sharper image, thus seeing a wider field of text with more letters or words displayed across the line requiring less movement of the X/Y reading table. The lower magnification level allows a wider field view of photos and the natural color image shows more definition and detail. See the difference in HD quality! LifeStyle is so easy to use! All LifeStyle models feature a simple front panel design. Power, Magnification and Image buttons are all located on the front panel. A single Power button, powers on the unit. Magnification buttons are large and ergonomic push buttons. To increase/decrease the magnification, simply press the Up or Down arrow buttons. The LifeStyle will zoom up or down continuously (not to a limited preset number of magnification levels.) To select or change the Image mode, press the large Left or Right arrow buttons to view the different Modes. Color, Enhanced Reverse Image (white letters on a black background), enhanced B/W, normal B/W, or the most commonly used monochrome images like yellow text on a black background, yellow text on a blue background or green text on a black background. Note: MicroSoft Windows Accessibility settings or computer magnification software is required to enlarge the PC image. 24″ wide-screen LCD monitor adjusts higher or lower, tilt forward or back, and swivels left or right for optimum viewing height and angle comfort. As a macular degeneration aid, the display may be angled slightly for peripheral viewing. Moving the sliding x/y reading table allows you to visually track the words across the line more conveniently.